SAP Business ByDesign provides a single cloud-based ERP package to help your midmarket business compete and grow. Use it to streamline processes from finance to CRM, act on real-time analytics insights – and jump on new opportunities. Gain greater control over your SME with small business management software and ERP tools designed to grow with you. Streamline key processes, gain greater insight into your business, and make decisions based on real-time information – so you can drive profitable growth. Discover, analyze, plan, predict, and collaborate in one integrated experience designed expressly for the cloud. Access all data and embed analytics directly into business processes to turn instant insight into quick action. SAP Hybris Cloud for Customer controls your sales, customer service, marketing and social media efforts from a single, simple-to-use platform. Connect your expense, travel, and invoice management systems with cloud-based solutions. Provide employees with an engaging experience and gain actionable insights that can help you better manage spend across all employee purchasing options. Enhance your corporate performance management with a SaaS platform. Select the business-and industry-speciﬁc services you need to build your ideal solution. Sage helps you manage and maximize your processes with cutting-edge solutions and cost-effective insights that are easy to implement, a snap to use and entirely indispensable. Meet client expectations, generate new revenue streams, offer digital services, and adopt new outcome-based business models for nonlinear growth by integrating data and processes through digital transformation and managing your total workforce in the cloud. Plan, source, stock, sell, recover, and analyze – all on one, unified IT platform. By integrating workflows and technology with your customers, suppliers, workforce, business processes, and the Internet of Things, you can find hidden ROI within your business and deliver meaningful customer experiences. Project manager to help you navigate projects, help you understand your challenges and constraints, and get your projects completed on time, on budget and to your satisfaction. Our programmers have a wide range of programming experience and the ability to deliver quality custom solutions – no matter the request. With application integration services, all of your line of business applications work together cohesively to provide end-to-end business processes that capitalize on the strengths of each of your point solutions. Technical support services provide the extra assistance necessary when deploying and managing your solutions. We’re dedicated to the success of our clients and would love to talk to you about becoming a part of the Accounting Micro Systems family. 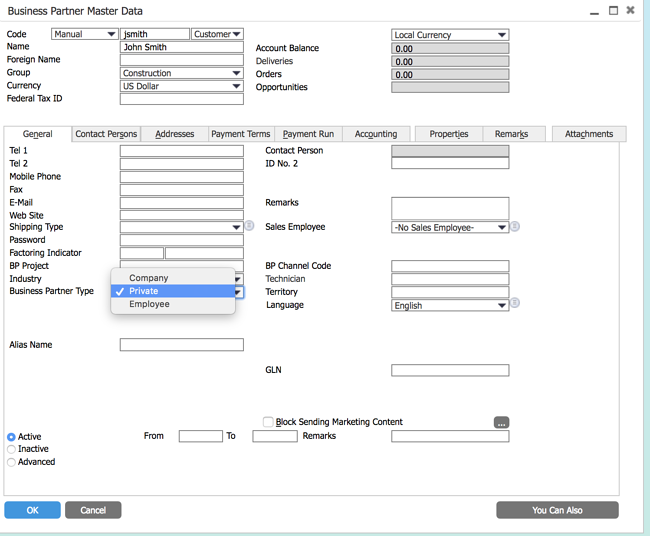 By default, accounts in an Enterprise Resource Planning application are designed for a business-to-business (B2B) model in which accounts represent companies and contacts represent individuals working at those companies. Unfortunately many traditional ERPs do not support private accounts. Instead companies are forced to set up an individual as a company where the company name is used to house the person name. Why incorporate person accounts into your ERP? Data Nomalization - the structure matches a real person's profile and includes demographic information pertinent to individuals such as age, gender, marital status, interests, etc. Relationships - modeling of real world private and business relationships such as spouses, siblings, etc. within a single household as well as relationships between persons and organizations. Consistency - supports a consistent interface for both the ERP and CRM aspects of an integrated suite. Flexibility - supports B2B and B2C transactions simultaneously and seamlessly without any messy workarounds. Visibility - gives the user a much easier paradigm for viewing records; both organizational and individual records appear in a single accounts tab. With person accounts users have one central place to have complete visibility to ALL records. This is significantly easier than only looking at companies/organizations in the accounts area and only individuals in the contact area. 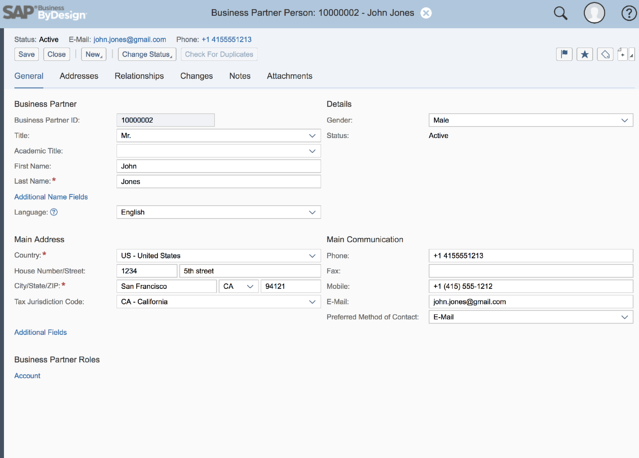 SAP Business One allows for the categorization of a Business Partner as Company, Private or Employee, but as shown following, this acts as nothing more than an indicator that a company is a sole proprietor. None of the data schema varies for Company vs Private. What is most telling is the ability to maintain multiple contacts for the person. 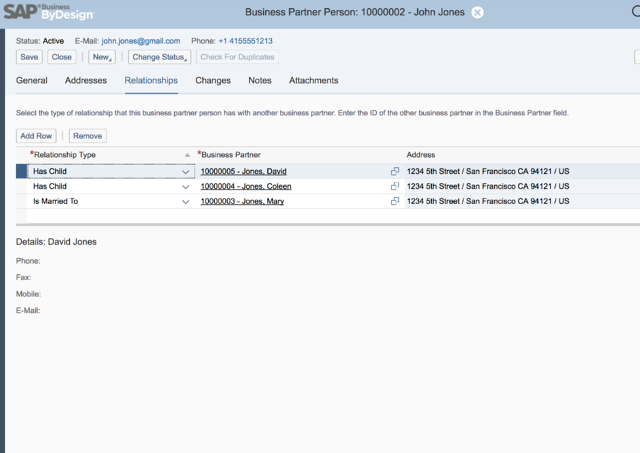 Going a level deeper into the relationships tab we can see that standard relation types may be maintained with other person accounts in the system. Show following are other person accounts maintained in the system who have familial relationships to John Jones. As stated, there are a number of compelling reasons to want to include support for person accounts in an ERP. Furthermore support for this functionality varies by ERP. If your company or organization has financial relationships not only with companies, but also with individuals, then consider putting this requirement on your short list.